ciety and the University context which has been conflict ridden for many decades. people live in a complex mixture of conflict and harmony. and negative perceptions of students’ experiences on campus. variables were measured using 1 - 5 Likert scales. cedure used by Michelle Fine in her study of HI (Fine 1994). Lazarowitz, Yosef-Meitav, & Zoabi, 2007). that “live on the hyphen”, between identities in contrast vs.
based on using the IDM methodology. Druze, 35 Muslims and 43 Christian) participated in the study. 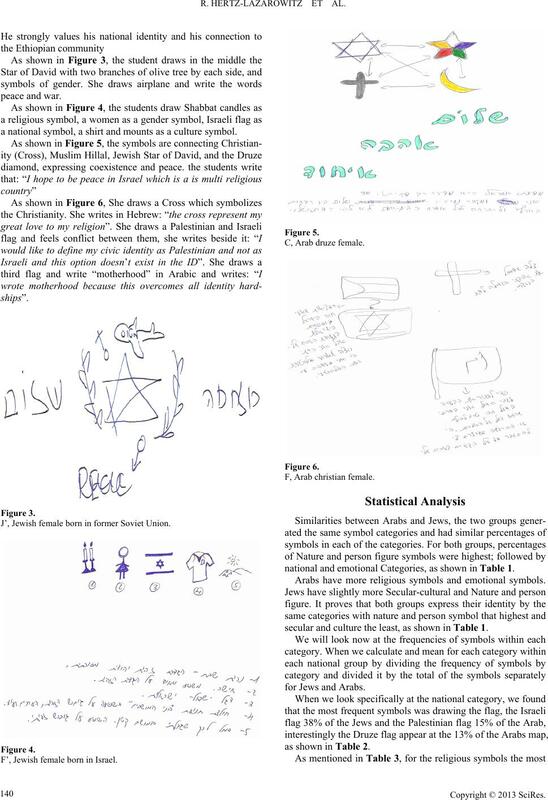 documented and analyzed (Farah & Hertz-Lazarowitz, 2009). Yosef-Meitav, Farah, & Zoabi, 2010). two) and text were separated or parallel. 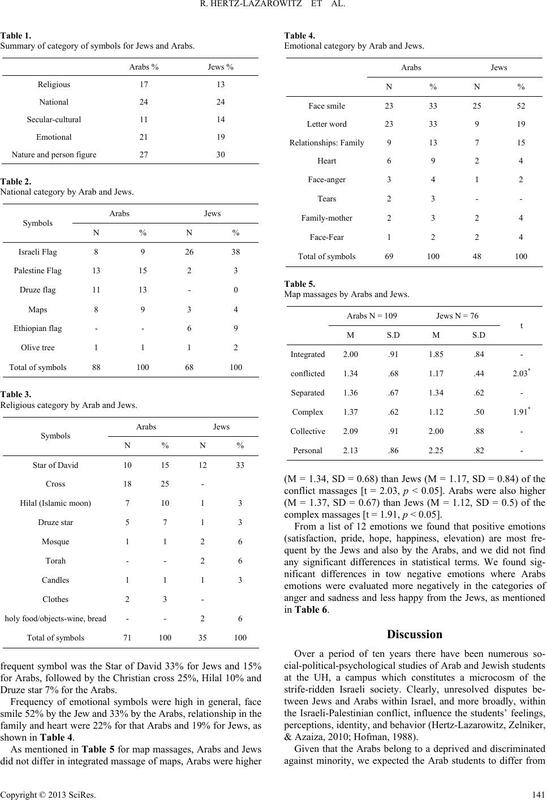 ly group attributes (e.g., religious symbols). 3) Evaluation of emotion: The coders used 12 emotions. the map (3) or very uncertain (1). IDM with the very short explanation. (N = 184) (Farah, Hertz-Lazarowitz, 2009). was born in Israel and lived in Arab village. dala and the Palestinian flag”. symbol for the Palestinians occupation (see Note). develop and always remained in the land on Israel”. pian flag, a home from Ethiopia and Ethiopian human figure. eople for justice and self-determination. a national symbol, a shirt and mounts as a culture symbol. J’, Jewish female born in former Soviet Union. F’, Jewish female born in Israel. national and emotional Categories, as shown in Table 1. Arabs have more religious symbols and emotional symbols. secular and culture the least, as shown in Table 1. Summary of category of symbols for Jews and Arabs. National category by Arab and J ews. Religious category by Arab and Jews. Druze star 7% for the Arabs. 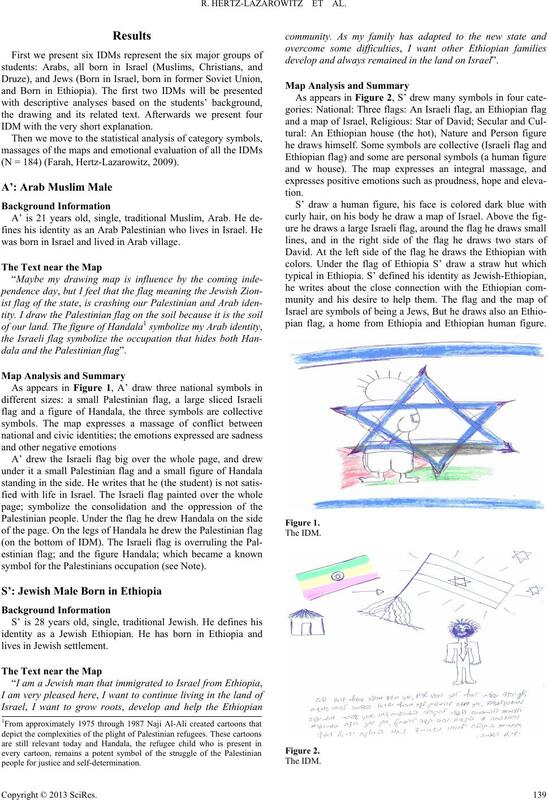 Emotional category by Ara b a nd Jew s.
Map massages by Arabs and Jews. complex massages [t = 1.91, p < 0.05]. & Azaiza, 2010; Hofman, 1988). 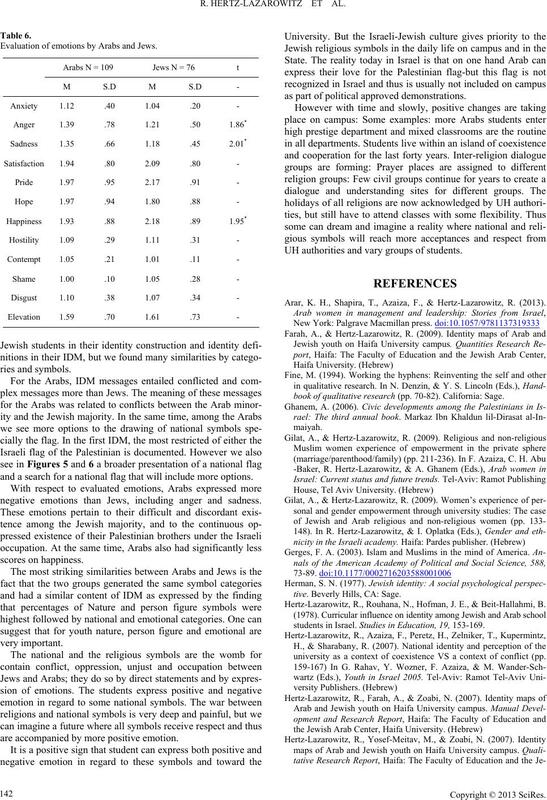 Evaluation of emoti ons by Arabs and Jews. and a search for a national flag that will include more options. negative emotions than Jews, including anger and sadness. are accompanied by more positive emotion. as part of political approved demonstrations. UH authorities and vary groups of students. Arar, K. H., Shapira, T., Azaiza, F., & Hertz-Lazarowitz, R. (2013). book of qualitat ive research (pp. 70-82). California: Sage. tive. Beverly Hills, CA: Sage. Hertz-Lazarowitz, R., Rouhana, N., Hofman, J. E., & Beit-Hallahmi, B.
students in Israel. 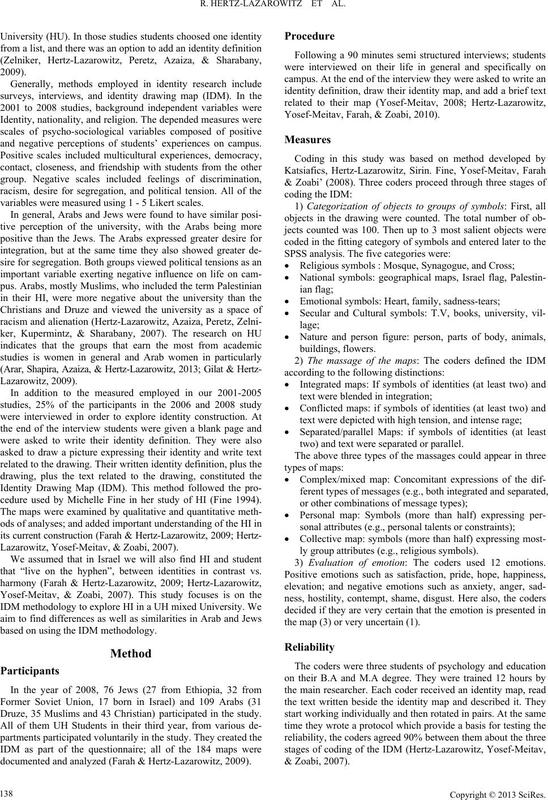 Studies in Education, 19, 153-169.
university as a context of coexistence VS a context of conflict (pp. 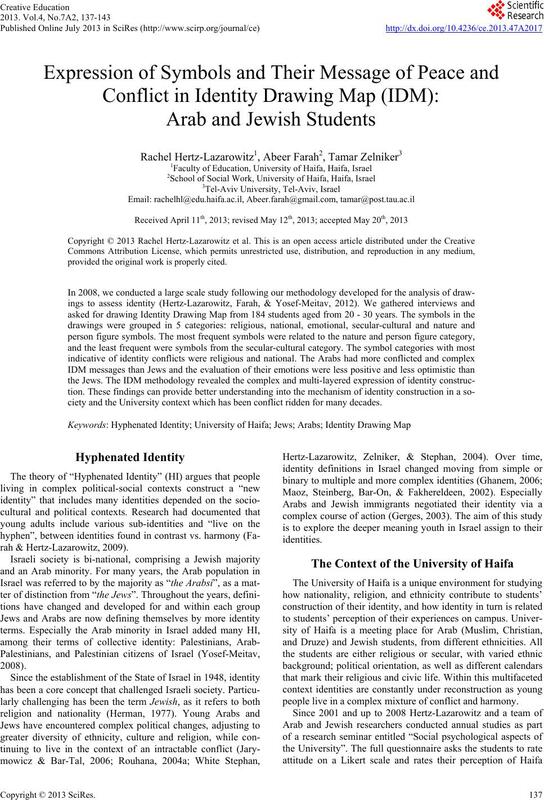 Hertz-Lazarowitz, R., Yosef-Meitav, M., Farah, A., & Zoabi, N. (2010). spectives on Education , Kyustendil, 12-15 June 2012.
standing (pp. 154-175). Bristol , IA: Wyndham Hall Press. 6th Annual Diversity Challen g e, ISPRC, Boston College. Journal of Peace Psychol o g y, 10, 33-52. White-Stephan, C., Hertz-Lazarowitz, R., Zelniker, T., & Stephan, W.
of Social Issues, 60, 237-252. Thesis, Haifa: University of Haifa. spectives (pp. 199-214) . 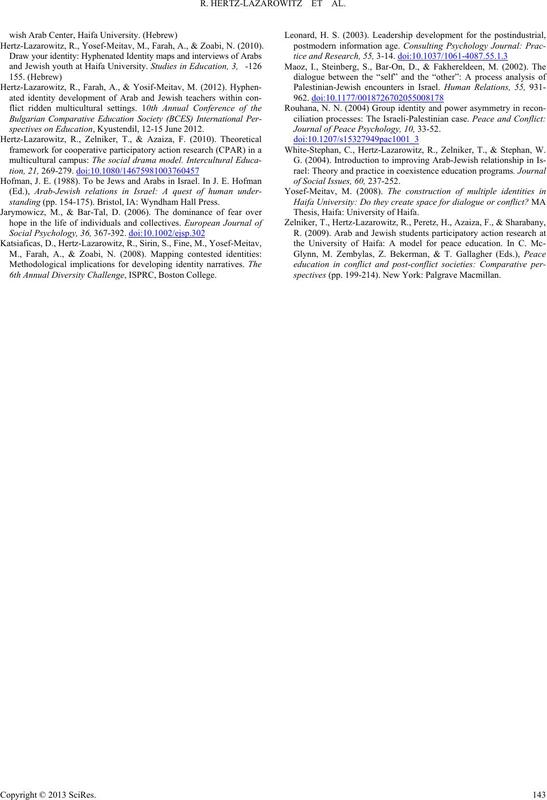 New York: Palgrave Macmillan.